Paul is just about the most enthusiastic book-connection person you could ever hope to meet. I’m still in the hope-to-meet category—Paul and I have never met but his is one of those names I keep seeing all over the place, and I figured it was time for all of us to get to know him better, though I imagine many of you are way ahead of me on that one. When you decided to become a high school English teacher, how did you envision your days? How different is the reality? I wish I had a better answer for this. I wanted to be a nurse. I was a hospital corpsman in the Navy. But when I saw the laundry list of math and science courses I might have to take, I switched my records over to the school of education. And this was not by default, mind you. While in the Navy, I had fancied myself a writer of sorts. And we (squadron buddies) were continually raiding the neighboring barracks buildings’ libraries for donated books that we could pilfer to make our own library look better (I think the statute of limitations has passed here and these were donated books). I thought that my days would be best spent reading and sharing books and writing and sharing the ideas that were coming from that writing, whether it was a quick thought capture, a line, or a piece that felt finished. Sure enough, some eight school years later, that is just what I am doing. Why was it important for you to create RAW INK Online? I wanted to go outside the classroom to reach my students in a place that might be most familiar to them–the social network. The first year was really neat because everything we did was brand new, you know? Our authors who joined in that first year are still a part of the community. I think RAW INK Online not only helped us to make connections with authors and within the classroom, but it created something really unique that Silver Creek High School students were doing with Web 2.0 technology. Can you speak about some of the friendships that have been borne out of your author-student connections? Sure. Chris Crutcher has helped us to kick off three out of four school years since the beginning of RAW INK Online. Our summer reading session with Deborah Wiles with COUNTDOWN was a neat experience for many of our students. The YA Super Chat we held in the spring of 2009 was magical (25 authors meeting in the chat room–five apiece for thirty minutes–for two and a half hours) was really neat. Some authors stayed just to talk to the others. Our friendships with authors like Cheryl Rainfield and Sarah Darer Littman have been vital to our students who have read their books. The interactions around SCARS (Rainfield) were powerful during the year that the book released, and the chats we have had with Sarah, and the fact that we met her for lunch in New York City with a group of students really solidified that relationship. Gae Polisner is relatively new to the community and her interactions with our students have really been the turning point in the lives of some of our dormant readers. We are going to miss people who make this site so special, but I would say that each of our 85 middle grade and young adult authors are most appreciated. I couldn’t do some of what we do without their willingness to be a part, their participation, and their willingness to receive correspondence from our membership. What character from children’s lit would you have liked to move next door to younger-you? Why? 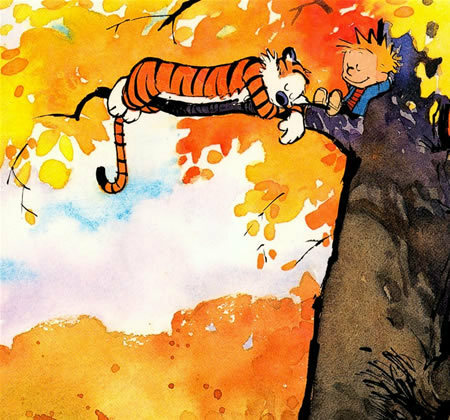 This might sound strange, but I would love to have a grown-up Calvin (Calvin and Hobbes) in my English 11 or AP ENGLISH LANGUAGE and COMPOSITION class. I think he would give a lead learner a real run for their money, don’t you? I would see him as a rebellious thought leader who would eat up the canon but would also love some of the snark of say, John Green, Don Calame, or Libba Bray. This entry was posted in Uncategorized and tagged Cavlin and Hobbes, Cheryl Rainfield, Chris Crutcher, Countdown, Deborah Wiles, Gae Polisner, Libba Bray, Paul W. Hankins, RAW Ink Online, Sarah Darer Littman, Scars. Bookmark the permalink. Paul is a true gem. One of thos guys where, it doesn’t matter how much good you’ve said about him, it still isn’t enough. He rocks my socks. And, I have had a chance to hug him in person. Let me tell you: good stuff! Love the post, Audrey. Here’s to new connections! Interesting post. I’m intrigued. Clicking over to RAW INK now to learn more.